We connect more and better resources to the women’s human rights field. PAWHR’s leadership transforms philanthropy through a rights-based approach that impacts the quality and effectiveness of funding, resulting in a stronger and better-connected women’s human rights infrastructure and increased resources for the broader field. Our Steering Committee is comprised of Wellspring Philanthropic Fund, Sigrid Rausing Trust, NoVo Foundation, Foundation for a Just Society, and Oak Foundation. We are a fiscally sponsored project of the Proteus Fund. 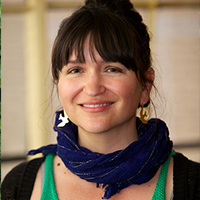 Keely brings more than a decade of experience in the women's rights field to PAWHR. She was formerly the Director of Programs at Urgent Action Fund for Women's Human Rights where she supported women's human rights defenders around the intersection of security and sustainability in time-urgent situations. This experience made her a strong advocate for the necessity of funding feminist movements. Previously, she worked with refugees and asylum seekers in the United States, Moldova, and Turkey. Her gendered lens has always focused on the particular needs of refugee and internally displaced women and girls. Her experience ranges from the UN High Commission for Refugees and Caritas at the global levels to local resettlement programs. Additionally, she has conducted research for Transparency International-Moldova and managed a pilot program for immigrant families in Denver. Keely received her MA in International Human Rights with a Certificate in Conflict Resolution from the University of Denver and holds a BA in International Affairs from the University of Colorado-Boulder. Annie has almost 20 years of experience in philanthropy for women’s rights. Prior to joining PAWHR, she served as the Senior Program Officer for Women’s Funds at Mama Cash, providing over three million euros in direct funding to strengthen women’s funds around the globe. She also served as Mama Cash's Learning and Evaluation Specialist from 2012 to 2015, and developed planning, monitoring and assessment tools for organization-wide learning, decision-making and accountability. From 2008 to 2012, Annie was the Director of Programs at Mama Cash, overseeing the grantmaking team and a budget that grew from 2.5 million euros to 5.3 million euros within four years. Annie also worked at the Global Fund for Women over a period of six years. Her responsibilities included Interim Program Team Co-Leader, and Senior Program Officer for Europe and the Commonwealth of Independent States and the Middle East and North Africa. Annie has also consulted for various foundations, local women's NGOs and women's funds in Central and Eastern Europe in strategic fundraising, influencing the donor community, and evaluation. She has been part of the governing bodies of various women's rights and philanthropic networks, most recently as Co-Chair of the the Steering Committee of the Human Rights Funders Network. She holds an MA in Social Anthropology from Central European University, and a BA in Romance Languages from the University of Chicago.